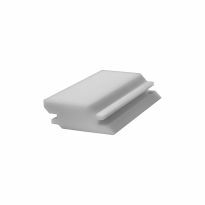 Ideal for use with smaller boxes and frames, making it easy to add a wide variety of strong, beautiful splines to the corners. 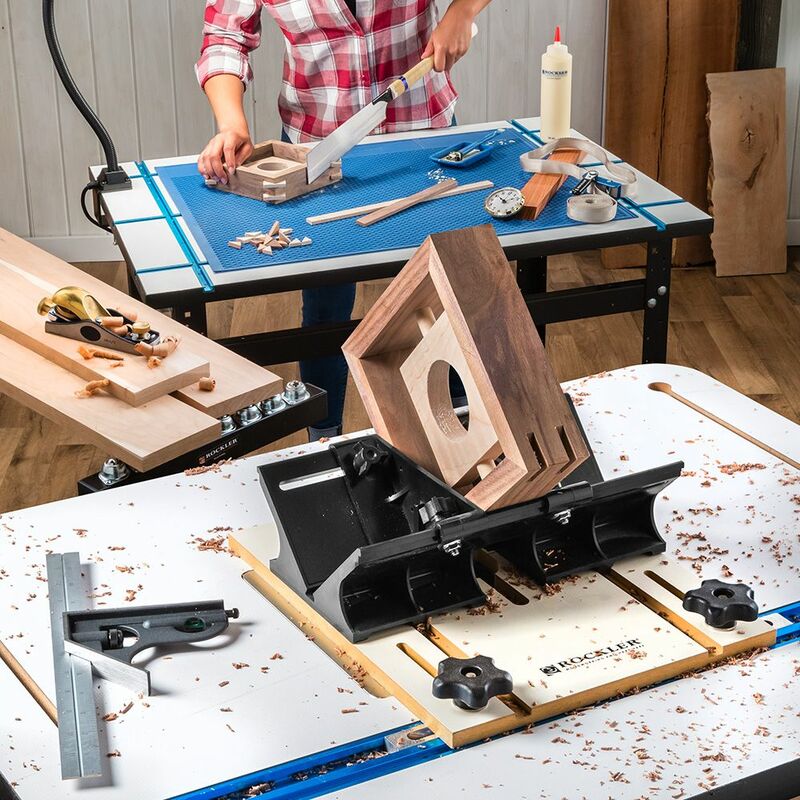 Dress up your mitered corner joints and add strength, too, with the Rockler Router Table Spline Jig! 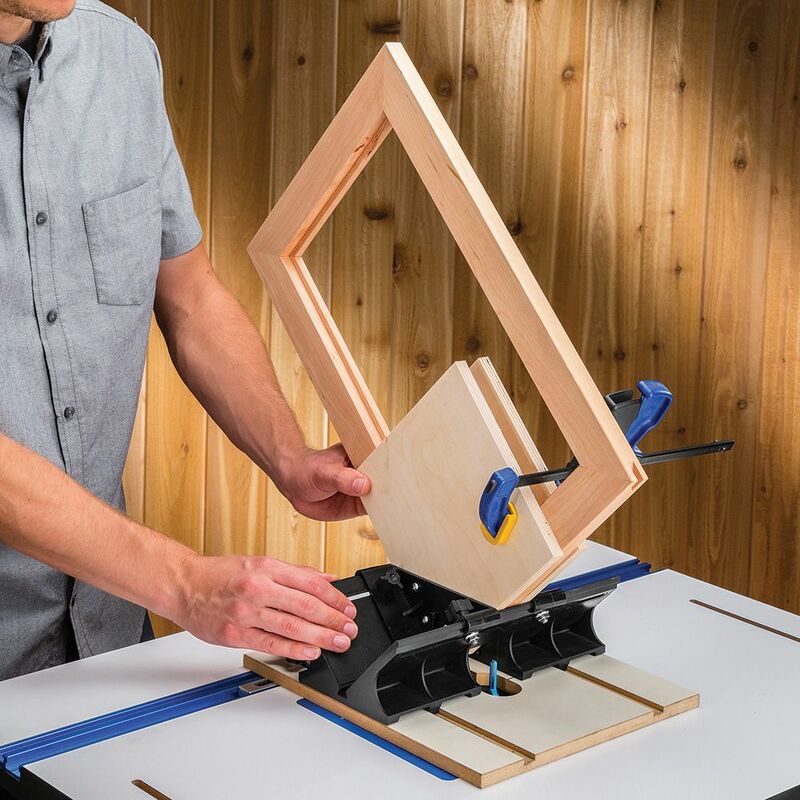 This clever jig locks into a standard router table miter slot and features a sled that holds your workpiece at a 45° angle while you guide it smoothly past the router bit. The adjustable fences act as stops to position your workpiece—one setting can cut all four slots for a frame, or eight slots for a box. 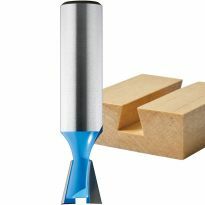 Try different router bits to achieve different effects—straight bits, V-groove bits, dovetail bits and more! 3-1/4'' and 6-7/8'' from center of the bit. Works great,easy to set up. I have only used for one application and it gave me excellent spline joints. Get item wish I had one sooner. I can't do all the nifty jigs the brainiacs on YouTube come up with, too much time and waste. 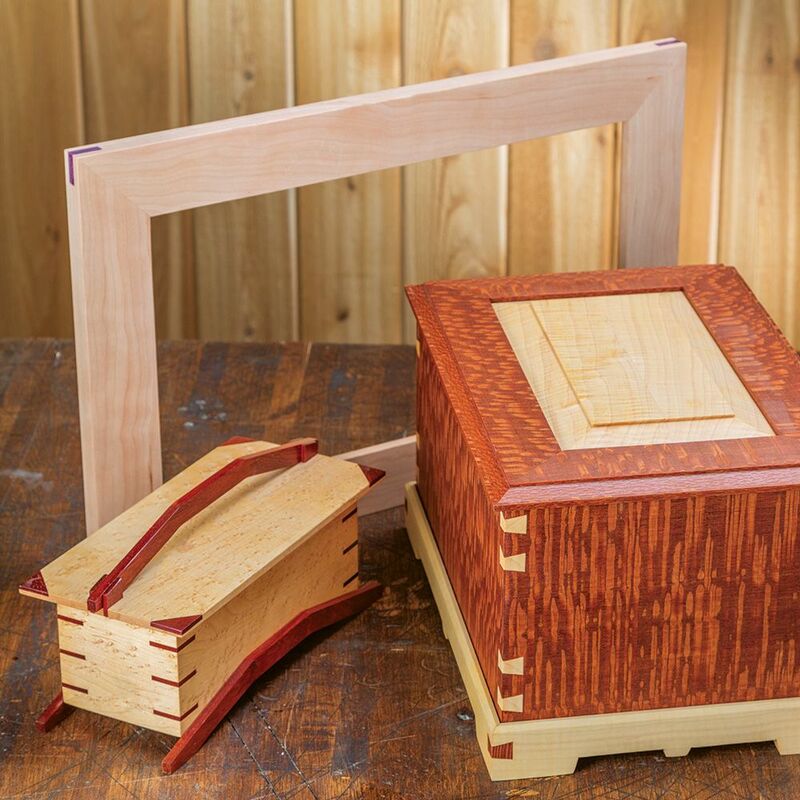 Rockler engineers hit a home run with this jig. Use it sporadically but the results are always the same - a beautiful finished product. Dovetail is my favorite bit. Outstanding jig.I highly recommend for all experience levels. The spline jig has been a great addition to my tool box.it is a simple set and adds a very pleasing accent to my projects. 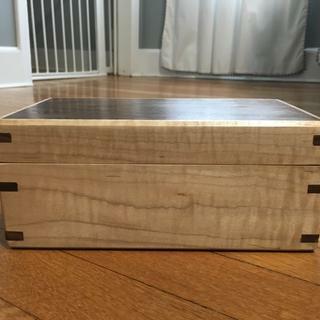 It's my first box and I like how the dovetail splines look. I think they really give it strength. I couldn't have done it without this jig. I highly recommend it. I still need more practice but the jig fulfills the purpose ???? This jig makes using spline jointery a less complicated processes. Totaly successfull right out of the box. Directions on use simple yo understand and easy to follow. Well made and versatile. 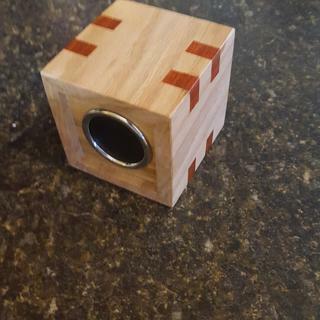 Bought this fixture to be able to make decorative cuts for inlays on corners of boxes. Followed instructions, works great and I am looking forward to using it on other projects. 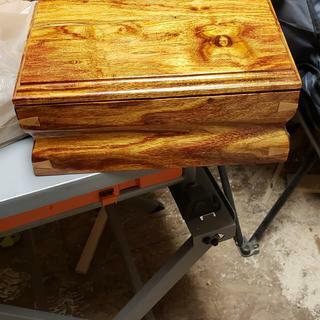 Being a beginner I wanted a jig to help me make some simple boxes with splines, it was easy to use, very satisfied and highly recommended. Nice addition to my shop. I built one for my table saw, but this gets me to a whole new world of easy beauty in cornering. Well designed. Simple set up and use. Very handy, well built jig. 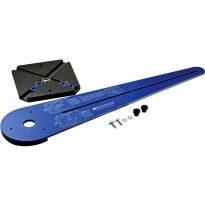 Cut nice spline channels with this sled. performs exactly as advertised..well made..simple to use and setup..made me look like a pro with my first project..my wife loves me again !!! Very nice but a little hard to get the bit the right height but is still a 5 star tool. The spline jig if consistent and accurate. Wouldn't be without it. This jig is GREAT. It really adds a new dimension to my work. I wish I had discovered it sooner. Very easy set up and worked perfectly. It works well for what it's made for, but the problem is that the guides on either side do not slide easily or square up easily. The centering guide did not come with mine. I'll call and see what it takes to get it. The carriage is sloppy in the slots. And the base is very thick, so I can barely get the bit up to a usable height. The holding mechanism is also sloppy. But if you hold everything tight to one side you can get a decent spline slot. Worked well, the only issue I found was when bringing the sled back it would catch an edge and cut a bigger grove. If I removed the piece after pushing it through the bit it worked great. Maybe add a sub text to cover spline routing. Fun jig for your creations. This jig enables the extra touches in your projects. The only issue with mine was a too much slop side to side. I remidied the problem easily by adding shim stock on the sides of the slides, A production remedy would be to have one adjustable slide that can be adjusted to compensate for wear. Haven't used it very much so far apart from for a few test cuts. Overall seems to be a well thought out tool. Pity it's not made in the USA. Don't like buying things made in China due to their terrible human rights issues and of course disdain for nature. The jig is a great help in cutting in pieces to shore up mitred corners. Has a little play in it, so added masking tape to the guide and the plastic tray has some "give" to it. Basically need to push it the same way and take out the play and works fine. Side guides are a little difficult to adjust. Sled is a little sloppy in the mitered channels. I have an older (35 years old or older) table top router table. 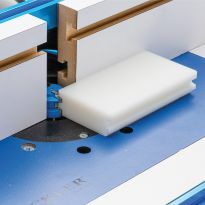 The miter slots in the table are not deep enough to accept the expandable sliders. Had to place some shims under the base to compensate for this lack of depth. All minor in nature, but I was able to come up with work around solutions. Bought the spline jig as I am making some jewerly and keepsake boxes for my family. Haven't used it yet, still working out box designs with mdf. I like the construction and the quality is very good. 5stars for great product but negative 1 star for the price. Just wish it was little bit more cheaper. But great product for someone who doesn't wanna make own corner jig from scrap wood. Need to make splines on my router table. I want to add wood decorations to my jewelry box as oppose to brass decoration or maybe add both. We will see. Making boom-box with Rockler boom kit. To strengthen corners of picture frames. I could have built a jig, but I couldn't have built it better than this for anything near this price. This looks like a real time saver, and by the time you get a box to the point where it needs splines, you're already too far in to risk messing it up with an imprecise tool. Seems like a no brainer to me. Usually do these spline cuts on the table saw. This sled will save in set up time. Interested in building boxes at a later date. Prompted by great sales price. To strengthen mitre joints and make nice contrasts. Simple to use. It is worth the money to save my time making the jig and spend my time making projects. price is good and looks simple to use. Saw a video on Facebook demonstrating this jig. 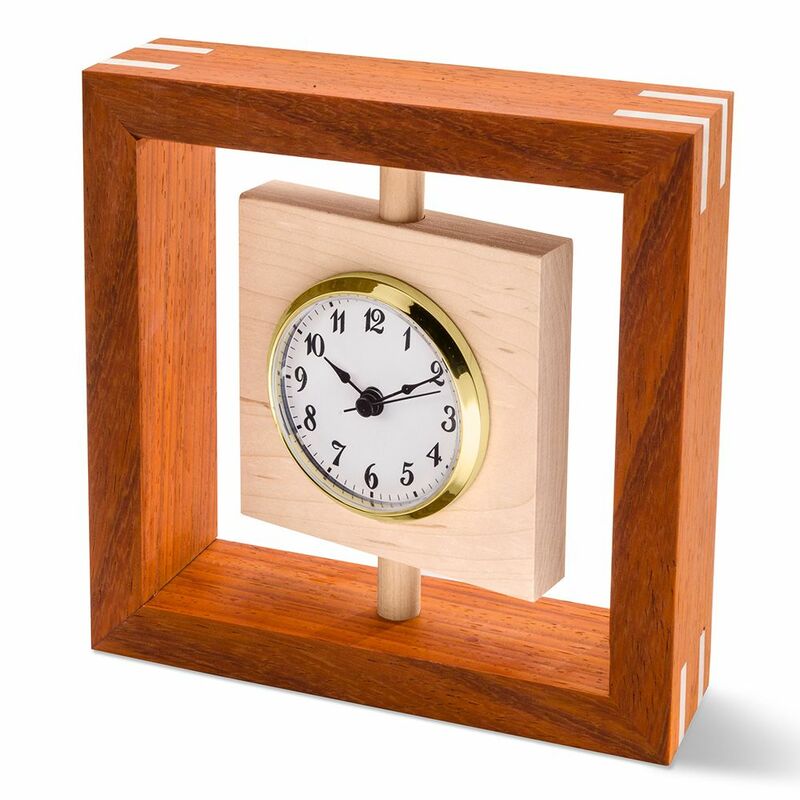 Is simpler than using Box, or Dovetail joints to assemble a quick box or frame. 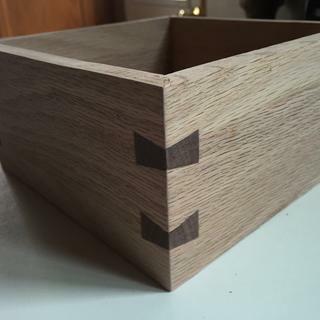 I'm gonna make some boxes and I want to make them with spline joints. Of the spline jigs I've seen this one looks the simplest and most durable. 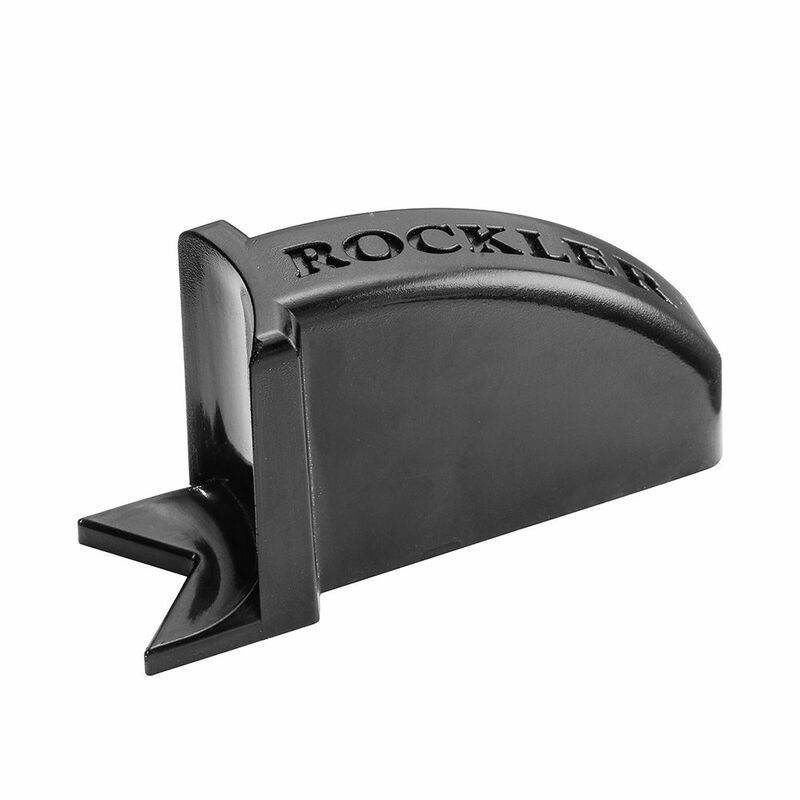 And like all the other Rockler tools I have, I'm sure it will be up to Rockler standards. measurements from the blade and did no want to build a second one for the router table. Always wanted, now on sale. I was going to build a spline jig but this looked like a better choice. Looks like it will work great for splines and accents. Ability to use the router instead of table saw to make these joints. I believe I will achieve a cleaner cut. Anybody canmake a corner. but if you want an attractive, strong corner with minimal effort, I'd recommend this jig. Makes a nice finishing touch to projects. Bought for some Christmas project to make the casing more decorative. 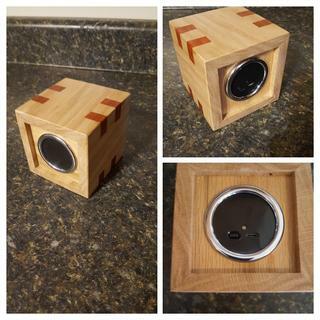 I want to build the wireless speaker box. Will this fit my Kreg Router Table? What is the minimum distance from the bit should the Dado track be to know if it will work? BEST ANSWER: I have a Kreg router table. The spline jig from Rockler works great! The overview states between 3 1/4 and 6 7/8. Thank You for the reply. From the center of my router arbor to the center of the 3/4" dado guide is 6 3/4" so I guess it should work. Guess I'll give it a try then. I have misplaced my instructions for this Item and I am unable to download them from your web site? 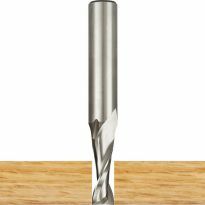 What length router bit is needed- the bits I have do not extend above the thickness of the router table and thickness of jig? can i do dove tail cuts with this router jig ? BEST ANSWER: Yes - you can use a dovetail bit to cut slots and then make the spline "keys" using the same bit. Takes a little trial and error to get the keys just right but the result is worth it. 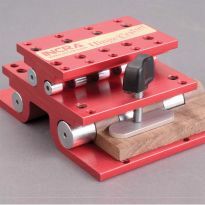 this is a great jig,yes you use it on any routertable i used it on the kreg router table. Will this fit on my Benchdog ProMax table? BEST ANSWER: Yes, this will fit your ProMax table. I first suggest that you measure your t-track distance to the center of the router bit. My router table is a custom size, and I found the jig to have enough distance on the slide to keep the bit centered in the jig. I have a Benchdog Contractor Protop Cabinet / Table Model RT150 and I just 2 months ago bought this jig. it works for me. Also this a neat and quick way to get multiple slots done very actuately and quickly. Is this jig compatible with the rockler trim routing table? BEST ANSWER: Probably not. 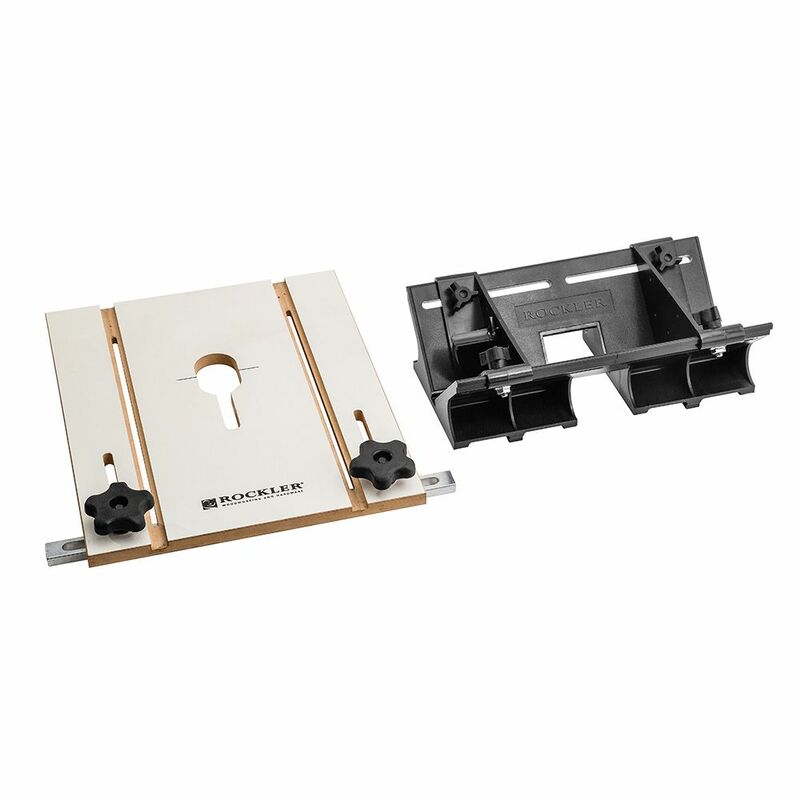 The spline jig locks into a miter slot usually installed on a regular router table. 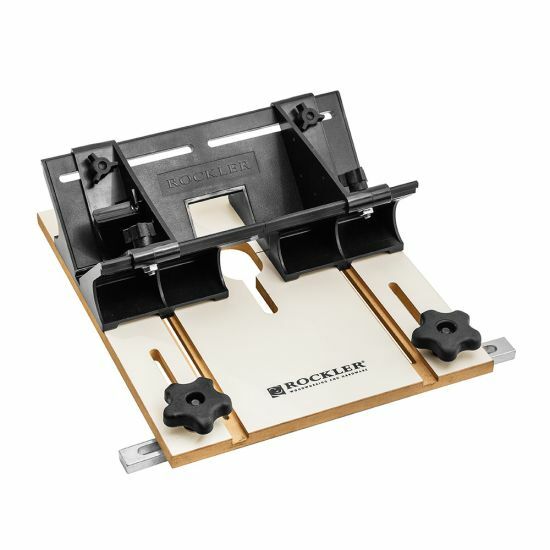 The trim router table toes not have the necessary depth from the center line of the front of the table. I suppose your could use the trim router and use is as an insert to a larger table that could then accomodate the miter track for this jig. By then you might consider just buying a full size router table. does the miter bars come with the jig? BEST ANSWER: Yes. This is a great jig - I used to cut splines on the table saw. Using the router table eliminates all the chip-out, especially in brittle woods. Yes, the two expanding miter bars come with the jig, along with the bolts and knobs as shown in the photo. Yes my kit did contain the miter bars. 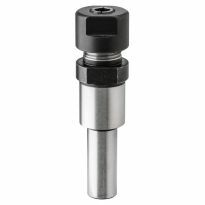 Do you get blowout as the work piece exits the router bit? BEST ANSWER: I am getting clean cuts in walnut with a nice sharp bit. I do however, find that the pressure of the jig itself is inadequate to hold the work absolutely still as it contacts and exits the bit, so I have been supplementing with clamps. Perhaps this would make a difference for you. I have only used it a couple times so far but I haven't had any blowout on the work I have done so far. You need a sharp router bit and 2 strips of tape on the exit side of your work piece. Will this work on a Bosch 1171 Router table? BEST ANSWER: I don't own a Bosch Router Table. 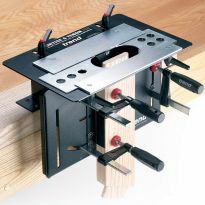 But, if the Bosch table has a miter track, I don't see any reason why it wouldn't work. As long as your router table has a standard 3/4” miter slot, it will work. The Spline Jig is anchored in the miter slot. What material does it use for the actual spline? I made something similar to this that I use with my table saw. Therefore, my spline gaps are 1/8" thick. Biscuits don't work for the spline material. What does anyone suggest for the spline material that will fit nicely in a 1/8" spline groove? Veneer? Layers of paper thin veneer? BEST ANSWER: I use various material depending on the look I'm going for. Most of the time is a contrasting hard wood that I have planed down or machined to the shape of the spline such as when using a dove tail bit. I've also used glued up veneers of same and contrasting hard woods to make the splines. I hope this helps! I cut thin strips of walnut or maple on the table saw (or band saw) that are slightly thicker than the spline slot. I then cut them to the length and sand to fit the spline slot. That way there are no visible gaps. You can use any hard wood that you like. Any tear out issue(s) from approach the router bit from the side rather than right-to-left? BEST ANSWER: None. I used it to do splines for grandchildren’s. Jewelry boxes and they were perfect. And I used birds eye maple and rosewood, both prone to tear out. Not my experiance. Try it and see. Can this be used with the Rockler Trim Router Table? BEST ANSWER: The spline jig is designed to slide in a miter slot. As the Trim Router table doesn't have a miter slot it can't work with the spline jig. Apart from that the table is also too small for this jig. I have a Bosch Router Table. How do I prevent the jig from sliding side to side? I can't tighten it to the miter slots. BEST ANSWER: Try this, add a small strip of painter's tape to the inside edge of the table miter slot. You can add more than one strip in order to increase its thickness. By trial and error you should be able to get a tight fit. The Overview says this jig is "Capable of accommodating a frame with a standard 11'' x 14'' opening", but why won't a larger frame such as 24" X 36" work with adequate supplemental tall fences? BEST ANSWER: To be honest about it, I have done just that. Adding taller support fences will allow you use the jig with larger frames. Hope this helps. Thank you Robert! It just didn't make sense to me why this wouldn't work and I sincerely appreciate your help in confirming my impression. While I haven't tried larger frames, I suspect the issue is not the fence size, but rather the side tolerances on the brackets that hold the frame in place. Even if one would clamp the side braces together there is much more weight and torque on the slot location. This could cause a slight wobble in the frame and make the cut slot somewhat wider in spots that result in a loose spline joint. Thanks Robert, I guess I'm going to find out since I ordered one after one of the other owners indicated he had done it successfully. If there is too much play maybe I can figure out a way to shim or somehow take the slop out. Will this work with my Incra Router Table? BEST ANSWER: Don't know about the Incra table but the jig has a fair amount of adjustment built in. Center of the track should be between 3 1/4" and 6 7/8" to the center of the bit. Hope that helps. I can not say if it will work on your table. I use a table I built 20 years ago and it works great. I do believe it should work on yours, because the jig is very universal. Will this spline jig work on the cast iron general table? BEST ANSWER: •Fits router tables on which center of miter track is between 3-1/4'' and 6-7/8'' from center of the bit. I have no experience with a General saw. I have been using a Woodhaven router table for years and it worked fine. will this jig work on a festool router table? BEST ANSWER: Read the last line of the "Features" for your answer. Should I use a upcut or downcut router bit with the spllne jig? BEST ANSWER: I use an up-cut bit and find tear-out is very rare. 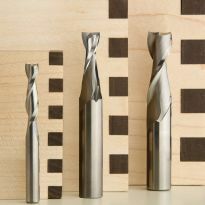 Is their a video demo for cutting keys for splines? BEST ANSWER: I do not know if there is one for this specific jig, but I'm sure there are some on you tube for cutting splines. Is the Rockler Router Table Spline Jig compatible with the Bench Dog® ProTop Contractor Portable Router Table? BEST ANSWER: Jerry, the best way to approach the answer to this question is for you to do some homework. Miter slot distances vary from one style router table to another. You need to measure yours from the center of the router bit to the inside edge of your miter slot. Once you have that measurement, you'll need to have the Table Spline Jig measured the same way: inside edge of the miter bars to the center of the router bit hole in the jig. will this work on a jessem brand table? BEST ANSWER: I believe it should as the product is universal and will work with many different saw tables. Will this work on a table saw? Can it be made to work with some modifications? Will this fit a Bosch RA1181 router table? What is the tolerance/maximum height of cut possible with this 'router table spline jig'? ie: what is the distance from the top of the laminate base to the bottom of the jig's sled. I build large box frames and like fairly deep splines to show on the sides. What is the minimum size of material that can be used on this jig? If I put a .5" X .5" X 4" piece on there will the grooves still support it?